“This is the one that officially makes me feel old,” Bart Mendoza says. Manual Scan, the band he started right out of high school with a few of his friends, will play their 40th anniversary show at this year’s Adams Avenue Street Fair. Originally a quartet, the current lineup includes Mendoza and founding members Kevin Ring on vocals/guitar and keyboardist David Fleminger, with Jarrod Lucas on drums and ex-Rust bassist Tim Blankenship. Otherwise, not much else has changed. “I’m still playing the same guitar and amp that I did at our first gig,” Mendoza says. Manual Scan was in the American mod and power-pop scene of the 1980s, a bunch of scooter-driving mods in suits. They began as Starjammer in the music room at La Jolla High School. Later, with a rotation in members, Starjammer became the Pedestrians. They recorded demos of original material, but by 1981 they were over. That’s when Mendoza and Ring got serious — sort of. Mendoza became the band’s chief songwriter. They gigged high-school dances and when they came of age, Hollywood and San Diego venues. 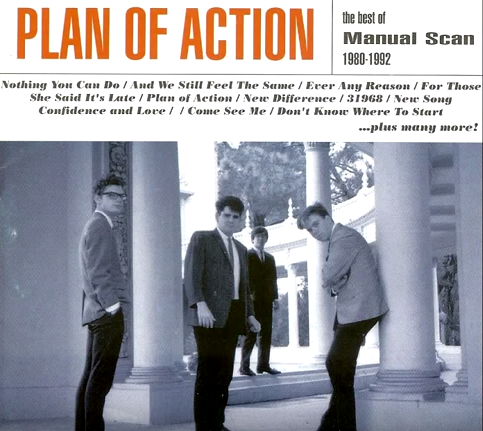 In 1982, Manual Scan recorded their first EP, Plan of Action, at Circle Sound Recorders on El Cajon Boulevard in Kensington. The band’s music has been featured in such films as A Girl to Kill For and was included in the Cherry Red Records box set Millions Like Us. Saturday, September 24, 2016, 10 a.m. to 10 p.m.